Some time ago I was looking for some new IEMs to replace my expired Sony MDR-EX90LP. It was never going to be an easy task, because the EX90 were a very nice pair of earphones. They were very comfortable, looked great (I'm not exaggerating when I tell you people would stare at them trying to find out what brand they were as I walked past), had very nice build quality, and a nice tone and fair sound stage. The only thing I could say against them is that they didn't have quite as much bass response as my previous Sony earphones. Victor HP-FX500, originally only available in Japan, but also sold as JVC HA-FX1000 for almost double the price in the West. Bargain! In fact I liked them so much that as soon as they started to show signs of dying (the left earpiece would lose connection, which I found was due to a loose connection in the mould where the single cable splits into two), I looked around online to try and buy another pair. Sadly, since I had owned them for around 2 years, the range had been revised, cycled out and replaced by the MDR-EX500, which didn't look as comfortable. The Sony started to die a little while after I bought my K701, so my first point of call was AKG. I checked out their range and had set my sights on the AKG K370, which cost £50, the same as what I paid for the Sony. Knowing that AKG is typically more expensive than the equivalent products from other major manufacturers (Harmann is a large company, but in comparison to Sony, could be considered small), and that the K370 also had an inline remote control, I made the assumption that the audio quality might not have been quite as good as my old Sony, so I decided to aim higher and splash out a little more. 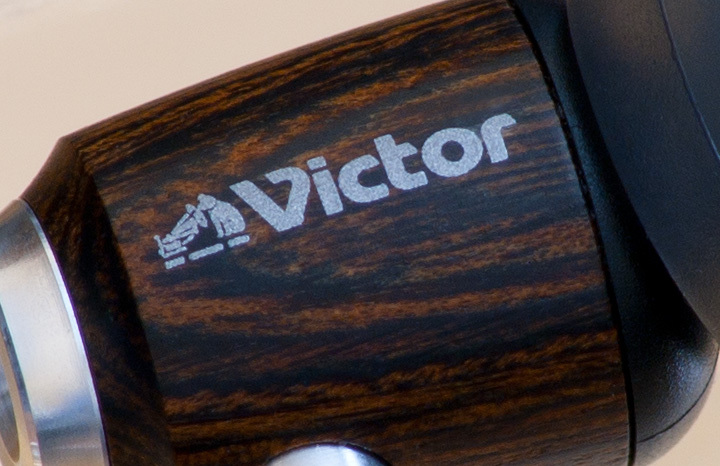 During my searching, I came across some very high end/expensive earphones called the Victor HP-FX700 which had gained a lot of attention for being made from wood. Not only was the enclosure made from wood, but the cone itself was made from a very thin layer too - the theory is that it would help replicate the sound of instruments more accurately. 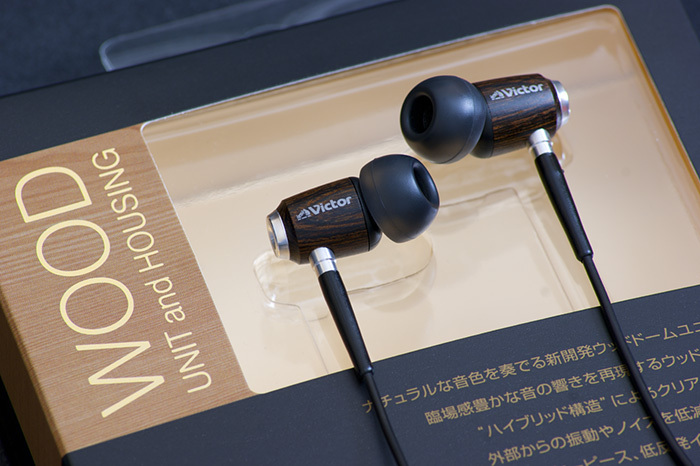 I knew as soon as I saw them that I wanted these, but at 29,000 yen ($370/£230) the price was too high for me to justify for in ears. Fortunately, I learned that Victor (known as JVC in the West) offered a less expensive version called the HP-FX500 (which I think was simply an earlier model with the FX700 being a beefed up version released later, rather than the FX-500 being a trimmed down FX700). The main difference being the driver size, and aesthetics, but at a much more reasonable price of 10,000 yen (or 13,000 yen/£100/$170 by the time I had imported them). It wasn't until I took these photos that I realised the logo on the earphones is the same logo as HMV use. HMV Japan is owned by JVC Kenwood holdings. The retail package for the earphones comes with 3 sizes of silicone tips, a medium sized pair of foam tips, carry case and an extension cable (since the main cable is just 0.8M long) - pretty standard fare as far as earphones go. The earphone cable is quite short, which I presume is so that people can connect them to remote controls for portable players and mobile phones. An extension cord is supplied, but it's thinner and feels of a lesser quality than the main cable. If you believe things like this make a real difference you might prefer to buy your own extension cable, but I couldn't tell a difference between using the extension and not. On the subject of the extension cable, a minor annoyance is that the combined length is a little too long to have the cable hanging free with a player at pocket height. I tend to find the cable swings around what with the weight of the connectors, so you will probably end up bundling it in your pocket. The headphone cable is the traditional "Y" type, meaning the left and right ear pieces have equal cable length, unlike the more recent designs where the left cable is shorter than the right, so the cable sits on the left and the right earpiece cable goes behind your neck. I prefer the "behind the neck" type of headphone cable since you can pull the earpieces out when needed and they sit in place around your neck, in contrast to the "Y" cable which you'd have to fuss around and put in your pocket or something. A minor point sure, but one that could save daily frustration. They are as comfortable as most other earphones, but my ears felt a little irritated after long term use, but that could be simply because I haven't used canal style earphones for months. I gave the foam tips a try and they were a lot better, although I prefer the sound I get from my Sony silicone tips. I also found that after extended listening that they had gradually worked loose since I don't insert them fully into my ears but that might be something to do with the size of the Sony tips, being designed for 13mm drivers and the FX500 being 8.5mm. At 16 ohms the FX500 are very easy to drive, as is the case with the virtually all in ear earphones and have a frequency response of 8Hz-25kHz, which seems to be about what to expect from decent IEMs. Something to note about frequency range though. 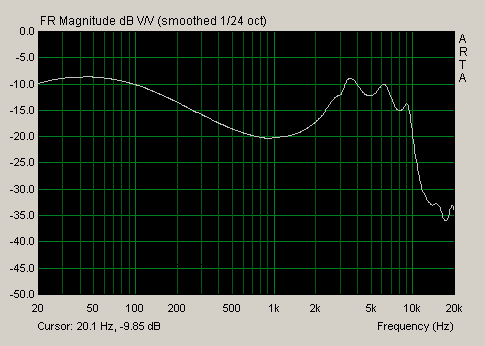 Frequency range, and frequency response mean different things. The frequency range tells us the spectrum of frequencies the driver can produce, from lowest to highest. Frequency response tells us how loud each frequency is played (or how well the driver responds) when a continuous volume sine sweep is played. This means that you can get some product A can have a frequency range of 25Hz-20kHz and product B can have a range of 5Hz-25kHz, yet it's possible product A will have better bass response. It may be louder for a given volume, but the driver won't be able to go quite as low as product B. These graphs can be misleading with the dB level since drivers have different impendances, and testers may use different sound levels. What's important here is the shape of the line. Out of the box the FX500 come with the medium tips attached, which I immediately switched over to the large tips. The reason for the change was purely sound related, as in the past I have found I get better bass when using the larger tips, and sure enough I did some testing and it still held true for the FX500. Using the largest provided the best bass out of the supplied tips, and out of interest I tried the tips from my old Sony EX90 which gave even better bass still. I would have to put these earphones in the "coloured sound" category, as they aren't neutral. They exhibit a smiley face style frequency response, which means they have better than average bass and treble response, but the side effect to that is that it can often feel like mids are lacking. It's not always the case that mids actually are lacking, but more often a case that the bass and treble boost creates that effect. That's not to say that the sound is flawed or that you would be wishing for more neutrality, this is my opinion purely from an analytical point of view. The sound signature of these earphones is highly enjoyable. The bass is deep, detailed and strong. It's almost akin to the effect a subwoofer gives at low levels but without sounding muddy - an impressive achievement, especially for earphones with a 8.5mm driver. The treble sits at a good level, giving the higher frequencies a clean, pronounced sound without causing additional silibance (the hissing sound at the end of some words in recordings). Some people have commented that the treble can be fatiguing, but I have not found this using my Sony tips. There are also aftermarket foam tips from Comply that have a "wax filter" that also acts to attenuate treble, so if it is an issue, there is always that option. To sum it up, the sound is crisp and powerful but would have benefitted from a slight boost to the mids. You will particularly enjoy these earphones if you listen to any bass heavy music or use them outside where bass typically gets drowned out. The only real sonic weakness of these earphones is the slightly recessed mids, but if that's the price you pay for deep, punchy bass without vocals becoming muddy and crisp treble without silibance, then it's a price worth paying. I may experiment with some after market tips and post my findings.